The administrative detention of Khalida Jarrar, imprisoned Palestinian parliamentarian and political leader, was officially limited on May 4 by Israeli military order, reported her lawyers with Addameer Prisoner Support and Human Rights Association on May 5. Jarrar remains imprisoned, charged before Israeli military courts with twelve purely political charges that include membership and leadership in the Popular Front for the Liberation of Palestine, the left wing Palestinian party Jarrar represents through the Abu Ali Mustafa bloc in the Palestinian Legislative Council. Other of the charges include advocating for the release of Palestinian political prisoners and speaking at public events. Israeli military officials have already stated their intention to continue to imprison Jarrar while she is tried on these political charges by an Israeli military court. Israeli military courts convict 99.74% of the Palestinians who appear before them and in no way meet international standards for a fair trial. Palestinians can be charged for violating any Israeli military order, including for membership in or “services to” “prohibited organizations,” which include all major Palestinian political parties. “Services” can include attendance at public events or calling for freedom for imprisoned Palestinians. Administrative detention is imprisonment without charge or trial on the basis of secret evidence for indefinitely renewable one to six month periods. It is in violation of international law and human rights norms. 401 Palestinians have been issued administrative detention orders by the Israeli military so far in 2015. “Whether Khalida Jarrar is being detained under administrative detention or for Israeli military trial, she is facing one framework of repression, racism and mass incarceration targeting Palestinian political life and expression. Both systems of detention are part and parcel of maintaining military control and occupation over the Palestinian people, and both are arbitrary forms of political detention and imprisonment that target Palestinian leaders and organizers,” said Samidoun Palestinian Prisoner Solidarity Network. The order was issued a day before a scheduled hearing on her administrative detention on May 6. Another scheduled hearing on April 29 at Ofer Military Court on the twelve charges against her was postponed as well with no action. This morning, the defense team of Palestinian Legislative Council Member Khalida Jarrar was made aware that her administrative detention military order was limited to end on 04 May 2015. The administrative detention lasted for one month and two days. The decision by the military commander to limit her administrative detention order indicated specifically that shortening the order does not undermine other arrest orders against Mrs. Jarrar, suggesting that the prosecution will continue to request that she is remanded until the end of her on-going trial. The cancellation of her administrative detention order does not prevent the military prosecution to use secret information against Mrs. Jarrar to justify her remaining in detention until the end of trial. Mrs. Khalida Jarrar was arrested on Thursday, 2 April 2015 after a raid on her home in Ramallah and received a 6-month administrative detention order on Sunday, 5 April 2015. A list of charges was also issued against her on 15 April 2015. The twelve charges against her revolve around her role as a PLC member and political leader and for her campaigning for prisoners. Addameer considers the arrest of Mrs. Jarrar to be a political one, and calls for her immediate release. Addameer also raises concerns about the health of Mrs. Jarrar in her continued detention. Medical tests have indicated that Mrs. Jarrar has multiple ischemic infarctions and hypercholesterolemia. Based on medical records from the Palestine Medical Complex, she has been admitted to hospitalization due to epistaxis where she was treated to stop continuous bleeding. She has also been previously treated for deep vein thrombosis numerous times. Mrs. Jarrar has had a travel ban imposed on her movement since 1998, and she has only been permitted to travel on one occasion for medical treatment in 2010, following legal proceedings and diplomatic pressure. Addameer’s position is that the prosecution’s recent actions confirm the political nature of Mrs. Jarrar’s arrest. The prosecution appears to be exhausting all legal procedures within its power to keep Mrs. Jarrar in detention. Addameer also affirms that this is a politically motivated arrest which contravenes international law, specifically the Fourth Geneva Convention, and the International Covenant on Civil and Political Rights, with regards to rights to political opinions and inherent civil rights. Currently, Mrs. Jarrar is one of 12 PLC members held in detention, 6 of whom are held under administrative detention. Khalida Jarrar is 52-years old and has been a Palestinian Legislative Council member since 2006. She also heads the subject of prisoner’s issues in the Palestinian Legislative Council, and is also deputy chairperson of the Board of Directors of Addameer. 1. Click here: Send a message to the Israeli Occupation Forces and demand the immediate release of Khalida Jarrar.It is important that the occupation learns that Khalida has supporters around the world who will not be silent in the face of this injustice. 2. Sign the petition! Sign and share this petition, demanding freedom for Khalida Jarrar immediately. 4. Send a letter to Khalida Jarrar – help support her and show her jailers that the world is with her! 5. Use the Campaign Resources to inform your community, parliamentarians and others about Khalida’s case. 6. Protest at the Israeli consulate or embassy for Khalida Jarrar. Bring posters and flyers about Khalida’s case and hold a protest, or join a protest with this important information. 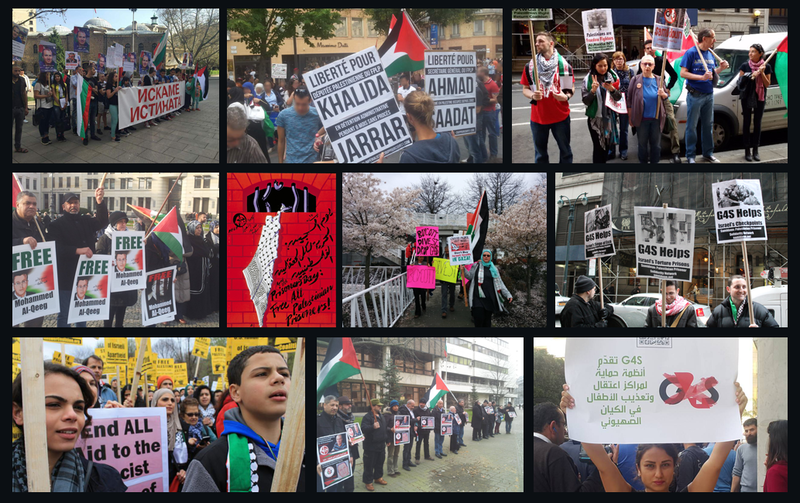 Hold a community event or discussion, or include Khalida’s case in your next event about Palestine and social justice. 7. Boycott, Divest and Sanction. Hold Israel accountable for its violations of international law. Don’t buy Israeli goods, and campaign to end investments in corporations that profit from the occupation. Learn more at bdsmovement.net.